I’ll be taking over this month’s blog from Paws Out and About. 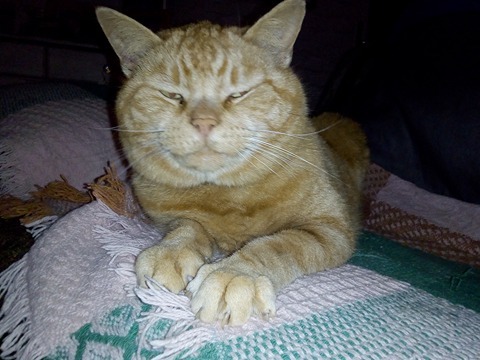 Let me introduce myself, my name is Mr Tiger Feet and I came to live at POAA HQ last May after my original human died. I wasn’t too sure to start with and I escaped and hid in the fields nearby for some weeks, only coming back at night to eat the food left out for me. Glad to say by now I have my paws firmly inside the house (surprising to think as I was an outdoor cat). I am part of this dysfunctional fur family of a small hairy dog with huge ears and 5 other rescue cats with 5 very different personalities, sizes and colouring! Paws Out and About has been as annoying as usual by trying to ‘play bite’ my head…seriously it only takes one cat head bump from me so that the ‘wig with paws’ to goes flying out of the way. But did I mention that I’ve been sampling the delights of Pero dog biscuits and training treats…well it would be rude not to, with them there in lovely little bowls near the fridge. I’ve taken over the official Pero branded dog bowl as I am much bigger than the dog , and as you humans know, cats are simply more superior. January has been rather cold, but I’m glad to say that the teenage humans’ bedroom has been considerably comfortable, I am there most of the day, only appearing for food or toilet breaks…human says I’m very much like the teenagers here! Human and the dog (with occasional help from small human and very occasionally the teenagers) have been spending lots of time in the garden, trying to tidy up…basically human has been trying not to run over the dog with the wheelbarrow and moving things about.